The season is over for Castleford Tigers Women after they lost their Women’s Super League semi-final at the hands of bitter rivals Leeds Rhinos. It was all looking so promising for the Tigresses as they went into the break 6-0 up. A first competitive victory over the Rhinos and a place in the Grand Final was in sight. However, just like they have done all season long, the Rhinos found a way to comeback and secure their place in Manchester with a 24-10 victory. 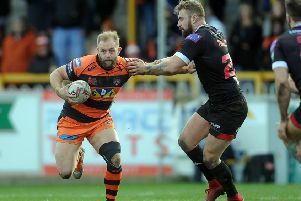 Castleford head coach Lindsay Anfield praised her side’s efforts, saying: “I can’t fault the players’ attitude. They left everything they had on the pitch. Georgie Hetherington open-ed the scoring. The Castleford original was in the right place at the right time as Leeds’ Sophie Robinson spilled the ball in her own goal-line area. Hetherington pounced on the opportunity and forced the ball down to give the Tigers an early advantage. Tara Stanley missed a goal attempt a few minutes earlier, but made no errors with her conversion to make it 6-0. Leeds conceded a lot more penalties than the visitors in the opening 40 minutes. However, the second half saw a role reversal. Three consecutive penalties inside five minutes of the restart all but gifted the Rhinos their opening try. Rhiannon Marshall’s effort was quickly followed up by Chloe Kerrigan’s try, which put Leeds ahead for the first time. Manina Spurr was next to go over and Charlotte Booth’s 60-metre sprint to the line extend the lead to 18-6. Leeds showed no remorse and Suze Hill’s try all but sealed the hosts’ place in the final. Kelsey Gentles finished off a well worked move from Castleford to make the score 22-10. But any hope of a late comeback was gone when Emma Slowe was shown red by official Ryan Stansfield for dissent. Speaking after the game, head coach Lindsay Anfield was disappointed with the result but remained proud of her team. With their season now over Castleford will take a break until November, but five of the Tigresses will be looking ahead to international duty as England take on France towards the back end of October.